Are you ready for an uncomfortable truth? If you’re not targeting the right customers with the right messages, investing more time and money in marketing may not work. Studies show that companies which invest in ongoing customer research grow 2-3X faster. Crazy, right!? Yet many marketers still struggle to make research a habit—they don’t know how to get started, what they should be looking for, or how to analyze and action the data they gather. Katelyn Bourgoin helps growth-ready teams overcome these common hurdles. 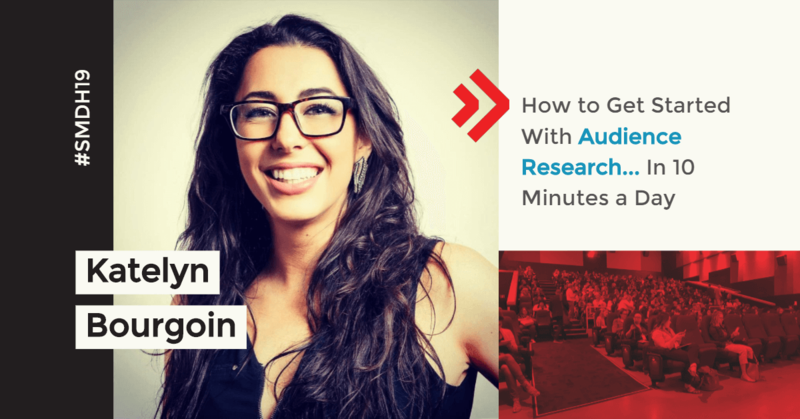 If you want to learn how to make research a habit, you won’t want to miss this super actionable presentation. It’s just too damn noisy out there. You’ve gotta know *exactly* what fuels prospective customers to buy from you. If you don’t, they’ll just ignore you. Katelyn Bourgoin is a 3X founder turned growth strategist. She understands the challenges product teams face because she’s been there herself. With operational experience spanning the marketing, tech, and hospitality sectors, Katelyn has been named as an influential entrepreneur by Forbes and featured in Inc., HuffPost, Bustle, CBC, CTV, Global TV and more. Katelyn’s past clients include high-growth startups, SMBs, and Fortune 500 companies like Target and Holiday Inn. Today Katelyn helps frustrated product teams use customer insight to guide innovation and identify untapped growth opportunities.